BOSTON — Today the Wyss Institute for Biologically Inspired Engineering at Harvard University and AstraZeneca announced a collaboration that will leverage the Institute’s Organs-on-Chips technologies to better predict safety of drugs in humans. 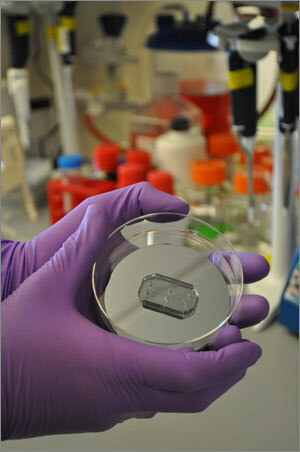 Human Organs-on-Chips are composed of a clear, flexible polymer about the size of a computer memory stick, and contain hollow microfluidic channels lined by living human cells — allowing researchers to recreate the physiological and mechanical functions of the organ, and to observe what happens in real time. The goal is to provide more predictive and useful measures of the efficacy and safety of potential new drugs in humans — which could represent an important step in reducing the need for traditional animal testing. The collaboration with AstraZeneca will apply the Institute’s advances in the development and validation of human Organs-on-Chips to develop new animal versions. These animal organs-on-chips will be tested alongside the human models to further understand the extent to which drug safety results in animals can predict how an investigational drug might impact humans. The testing of a potential new medicine on animals is a small but necessary step in bringing this medicine to market. Regulators require safety data from animal studies before giving the required approval to test a new medicine in humans. However, animal tests do not always accurately predict what will happen in humans. *Part of this research was sponsored by the U.S. Army Research Office (ARO) and DARPA. The views and conclusions contained in this document are those of the authors and should not be interpreted as representing the official policies, either expressed or implied, of ARO, DARPA or the U.S. Government.